Twitter provides an easy to use API allowing you to display your tweets on another web site or inside another application. This article explains how to do this in a Ruby on Rails application using the new OAuth authentication mechanism. It assumes you already have a Ruby on Rails application. I’m not going to go into tedious OAuth implementation details, just the results! Create your application on Twitter, go to http://dev.twitter.com and click Register an app. Fill in the details giving it a name such as “My site tweet feed” and make it read only. The values you enter don’t really matter since no one else will be using your application, so long as a basic description and application website are set. Take note of the Consumer key and Consumer secret values, you will need to copy these into your application later. Click the My Access Token link on the right. 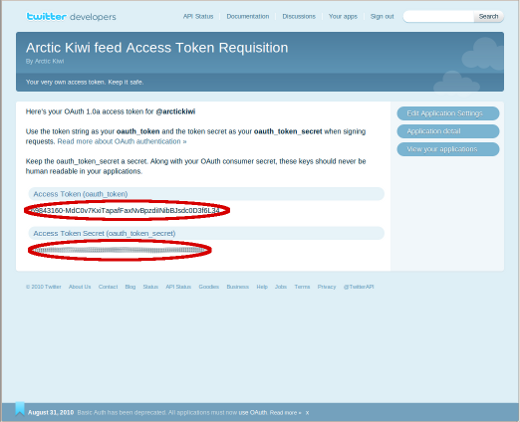 Note the Access Token and Access Token Secret, you will also need to copy these later. Now you’re ready to modify your Ruby on Rails application to connect to the Twitter API. There are a number of Ruby gems available for connecting to the API. I’ve had success with Grackle so that’s what we’ll use. 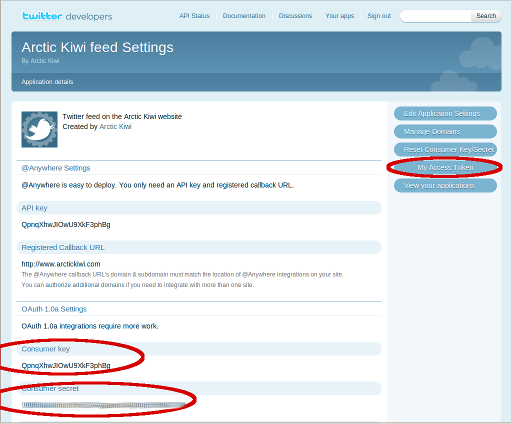 """Connect to the Twitter API and pull down the latest tweets"""
Make sure you update your MY_APPLICATION_NAME, unless you want to get our tweets. Also enter your consumer key, consumer secret, token and token secret. You should see a whole lot of text flash past the screen as the client hits the API, downloads the tweets and sticks them in the database. it means one of your keys or secrets is wrong. As with any other model in Rails you can do whatever you want with them, like display them on a web page. You will want your tweets downloaded automatically all the time. I call a rake task from cron job which runs every 10 minutes for this. I output to a log file so if something goes wrong one day I can see why. Good luck, and please leave a comment if you find this useful.